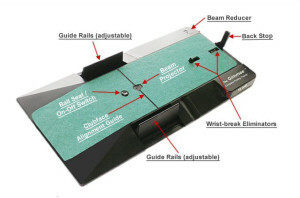 Home › Training equipment › What are the Best Putting Aids? What are the Best Putting Aids? Want to improve your putting? Then you should practice (obviously)! But, if you are not practicing the right way, then it will all be for naught. Luckily for you, there are many gizmos and gadgets on the market that will make your putting practice sessions more effective. With help from the best putting aids, you should become a more consistent putter, and eliminate those devastating three-putts! The Eyeline Golf Ball of Steel weighs fives times more than an average golf ball. The extra weight forces you to make a solid putting stroke through the ball, and will help players eliminate their decelerating putting stroke. It is made of a steel core, with a silicone coating/padding. It is safe to hit with your club for putts 6 feet or less. DO NOT use the Golf Ball of Steel for putts greater than 6 feet in length, or you may damage your clubs, and injure yourself. 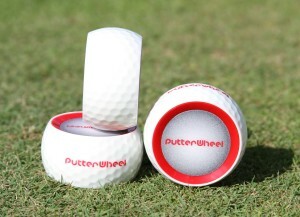 The appropriately named Putter Wheel is wheel-shaped golf ball that will help improve your stroke and alignment. It is designed to simulate the weight, size, and feel of a standard golf ball. If you mishit the ball, the Putter Wheel will immediately begin to wobble and curve off the intended path. Only when you make square contact will the ball roll straight. The red edges are used to make sure your eyes are over the ball every time you set up. If you can see any part of the red edge, then your head/eyes are not directly over the ball. Watch the video below for a complete overview of the Putter Wheel features. If you struggle with lining up over the ball, or often hit putts off-center, then the Putter Wheel is for you. It is one of the best putting aids to help you hit consistently straight and true putts. Overall rating: 4.5/5 – Simple product that does what it is supposed to do. A little pricey for what it is. Comes in a pack of two; also includes a template so you can draw alignment lines over your real golf balls. This odd looking contraption claims to help you improve your entire putting game. It works by combining a a huge variety of features, including: a projected laser beam (visible only to user) that helps you keep your head still, adjustable guide rails to help you keep your putter square at impact, a backstop which will help keep your backswing short and accelerate your follow through, and “pop-ups” to help you stay on the correct swingpath. Combined together, these features should help you develop a smooth, consistent, flat putting stroke. The most useful feature of The Gimmee Putting Trainer is the light beam that is only visible to the user when his/her eyes are in correct position above the ball. The purpose of the beam is to help you keep your head absolutely still when putting. The beam is red color before you hit the ball, and turns green for two seconds after impact. If you look at the green light for the entire duration, then you should have successfully kept your head down. If you often lift your head during putts, then The Gimmee could be the device for you. Overall rating: 3.8/5 – Some features are a bit gimmicky, and the product is cheaply made for the price, but still a decent device for improving your putting stroke. Good for using indoors on a rainy day. 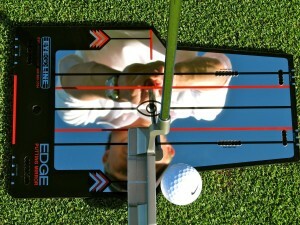 Another awesome golf training product from Eyeline Golf, the EDGE Putting Mirror helps you perfect your stance/setup, while also training you to swing your putter on the correct path. 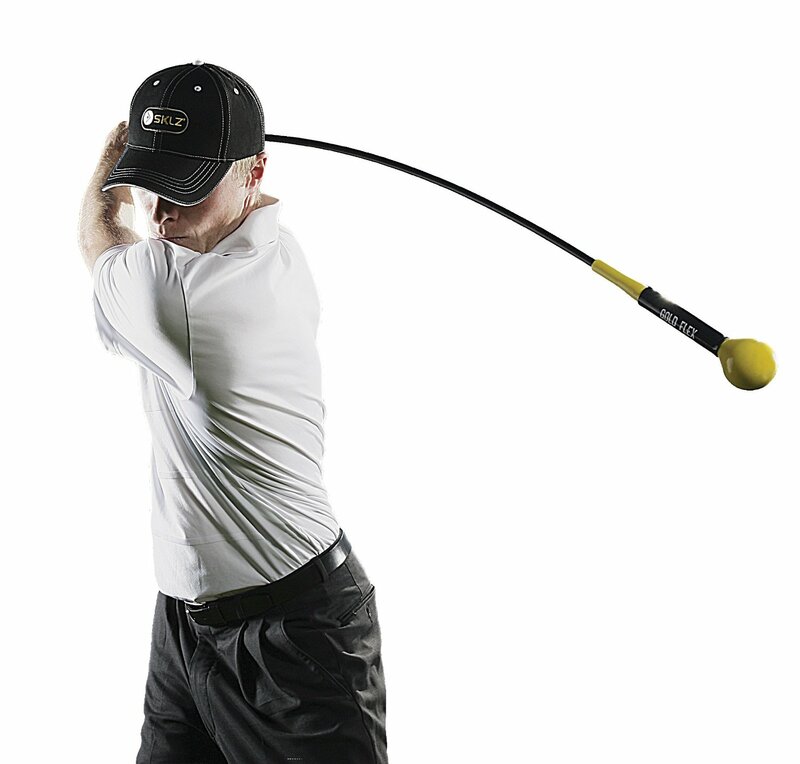 It works by giving you a full view of your setup — eyes, putter face, and shoulders — when you stand over the ball. Just point the alignment lines at your target, and make sure your putter is square to those llines. After some practice, you will be able to setup perfectly each time. The Edge Putting Mirror also has slots built in so you create putting gates that will help you swing on the correct path every time. Do you keep burning the edges on your putts? It could simply be that your alignment is off. The EDGE Putting Mirror is easily the best putting aid for ensuring that your stance is correct and that you are swinging on the correct path. If you want to become a consistent putter, then you definitely should check this out. In fact, it has been used by various PGA tour pros including Miguel Angel Jienez, Ricky Fowler, Darren Clarke, Rory McIlroy, and Graeme McDowell. Overall rating: 4.7/5 – The Pros trust it, and so can you! A bit pricey for such a simple tool though. 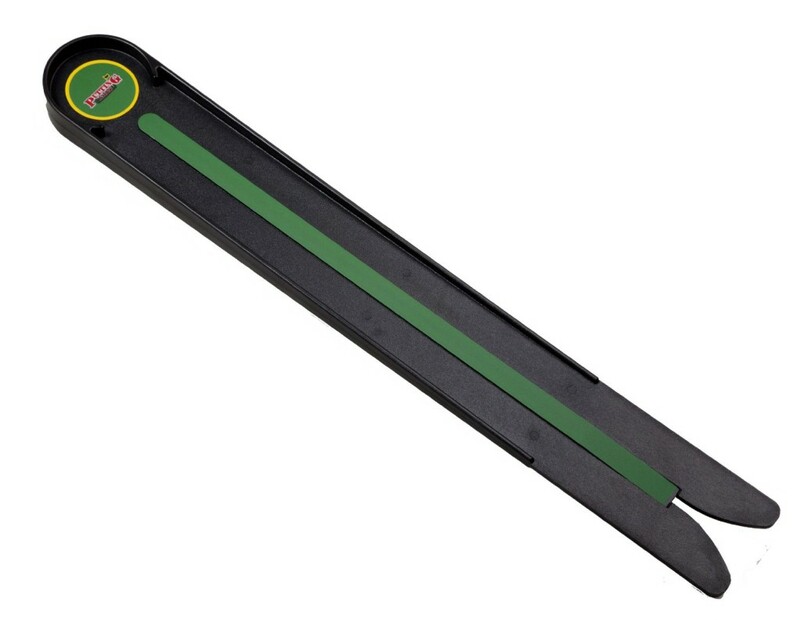 The Putting Alley is a 27-inch long putting apparatus that will help you correct your putting stroke through repetition. 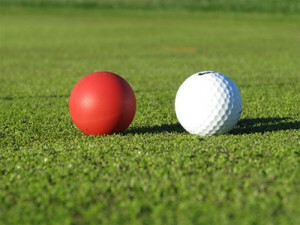 The skinny green putting “alley” is slightly raised, so that the ball will fall off the edge if you do not hit it square. The concept is simple (think of it like a miniature bowling alley). If the ball falls off to the right, then you are pushing your putts, and if it falls off to the left then you are pulling your putts (for right-handed players). Over time, you will be able to self-correct your putter-face angle, swing path, and ball impact, so that you will hit solid, straight putts. The Putting Alley has 2 different putting strip widths. On one side, the strip is 1 inch wide. Successfully hitting across the entire alley is about equivalent to hitting a 10 foot putt. The other side has a strip that is only 0.5 inches wide. Successfully completing this side is equal to hitting a 20 foot putt. Do you push / pull a lot of your putts or consistently miss your line? Want to make more long putts (>10 feet)? Then the Putting Alley could be one of the best putting aids for you. It will give you a controlled, consistent putting surface so you can work out the small kinks in your stroke, and hit consistently straighter putts. The device is small enough to carry around anywhere, and is great for use in your home or office. Overall rating: 4.5/5 – Great, simple putting aid that works as advertised. Not as useful for beginners, as it won’t help you fix your stance / setup. ‹ What is the Best Golf Glove?